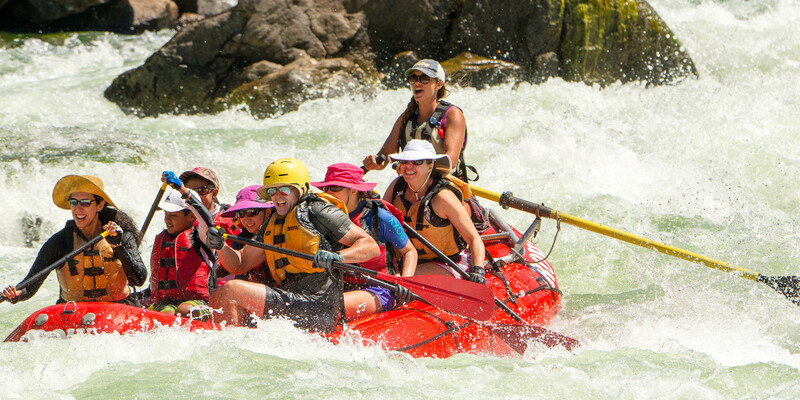 Rafting the Rogue River is one of the best adventure vacations you can find. Its warm, lightly surging waters are challenging yet accommodating. As you wind your way through pine-coated canyons within the “Wild & Scenic” wilderness, you can spot black bears scavenging for blackberries on other side of the river or wading in to search for salmon. Pines and firs burst with vivid green new growth, wild flowers bloom along the banks and the Rogue itself is wildly alive with winter runoff. And, of course, there’s the people you bring with you on your exploration, the people who paddle and play alongside you. TOP 13 ACTIVITIES THAT MAKE THE ROGUE RIVER THE WHITEWATER ADVENTURE VACATION YOU’RE LOOKING FOR! Who says you need a raft to go down a rapid? There’s nothing quite as exhilarating as sitting back and letting the wave train take you through its eddies and swirls. There’s more than one way to take the plunge on the Rogue. With cliffs of all sizes bordering the waterway, there’s no shortage of perfect jumping spots with warm, calm waters waiting below. So try out your cannonball, pencil or signature dive move and dive right on in. Rafting down the Rogue is like being in the middle of a nature show, one with with bears, bald eagles and beavers—oh my! And there’s more. Look out for river otters coasting along, osprey and great blue herons taking flight, or salmon and sturgeon swimming their way among their currents. Just make sure you keep your eye on that drop up ahead! Throw your hands in the air and go on nature’s rollercoaster. There’s nothing as exhilarating as punching through the waves and feeling flurries whirl in your stomach as your raft ratchets up and then rolls into its big drop. Better yet, you can feel the wind in your hair, the waves splashing on your face and that smile that just won’t go away. Scramble through the unique wilderness on side hikes, discovering slot canyons and hidden rockslides just begging for you to discover why the best waterparks might be found in nature. There’s no end to the exploration on the Rogue. If hiking is your passion, check out our Rogue River Hiking trip. We enjoy putting the “go” in gourmet, from our freshly cooked breakfasts to our fabulous lunch and dinner spreads. Everything tastes better after a day of adventures out on the water, whether it’s deli meat or perfectly grilled steak. Infuse your food with the aroma of the outdoors and gobble it up. Roughing it on the Rogue doesn’t have to be “rough.” Our lodges along the Rogue give a touch of glam to your camp, so that you can fall asleep far from city lights, surrounded by nature, without sacrificing that comfortable mattress and warm water that we all know and love. Nothing says camping like camp songs. Gathering around a fire or just some riverside scenery while listening to live music is a pretty special experience. Wind down and wine down as you listen to the Rogue serenade with old and new friends. It’s not all whitewater rapids on the Rogue. Off-the-beaten path you can discover secluded swimming pools—natural oases surrounded by scenic pines and passing wildlife. Sometimes on the river it’s nice to be still and appreciate your immersion in nature and postcard-worthy views. Our go-to beach game? King of the kayak. Paddle your way to victory and revel in the profound sense of satisfaction of standing your “ground,” undefeated, by ripples, waves or foe. Girls are about so much more than primping and pampering, and LBDs and pedicures can be traded in for baggies and paddles. Memories are made as you tackle a rapid together, sit on a bank of a river together or find new stories to tell while relaxing in a quiet natural swimming hole. Unplugged and off-the-grid, what better way to disconnect from everyday business and reconnect with family than on the Rogue? It’s exploring together, adventuring together, playing together and finding yourselves rejuvenated in nature together. The family-feels are palpable, see for yourself! Reconnecting on the Rogue Video! There’s nothing quite like taking a nap on a sun-warmed raft after a fun day out on the river. Gently lolling waves against the shore are a white noise no sound machine can replicate. And there’s no better way to wake up than a face-full of stray water spray from a “rogue” wave.